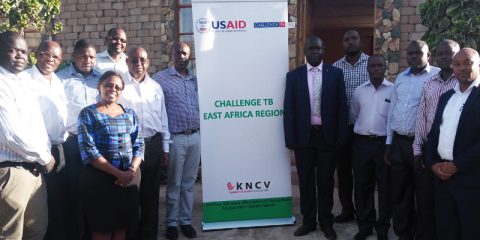 KNCV is active in the East Africa region as part of the Challenge TB program funded by USAID. The program focuses on Cross-Border TB control, drug and commodity management systems, human resource development, patient-centered care and treatment and comprehensive high-quality diagnostics. Today we focus on the Cross Border TB Initiative (CBI), which strives to promote cross-country collaboration and coordination in order to improve TB prevention and treatment and surveillance across national borders. The initiative advocates for the inclusion of TB on the agenda of existing or potential future cross-border health committees. The CBI encompasses TB situation assessment, mapping facilities and their capacities, and helps realize the development and implementation of tools that allow for local micro and joint action planning. Furthermore, the CBI aims to establish a cross-border reporting and referral system to improve treatment adherence, reduce the numbers of patients lost to follow-up, and support contact tracing. In the long run the CBI expects to create a platform for experience sharing among implementing facilities in different countries to streamline operational interventions and to optimize the use of existing systems. All these elements together form the East Africa CBI that aims to realize better collaboration between borders in the prevention and treatment of TB. Keep an eye out for future KNCV newsletters and the KNCV website for updates on the activities in the East Africa Region.